← Time Flies, but Am I Having Fun? The Devil in White City: Murder, Magic and Madness at the Fair That Changed America by Erik Larsen is a remarkable tale, the story of two parallel universes unfolding beside each other – one a world of architectural innovators building a fantasy land on the shores of Lake Michigan, the other a macabre world of a Victorian era serial killer and his house of horrors. These two worlds collided at the 1893 Columbian Exposition in Chicago, as Daniel Burnham’s Utopian White City attracted hundreds of thousands of people to the Windy City, and into the waiting trap set by Herman Webster Mudgett, alias H. H. Holmes, failed doctor, quack pharmacist, con artist, and serial killer. Larsen weaves the Utopian and dystopian worlds together in alternating chapters, pulling readers into the unfolding drama of a psychopath’s plot in one chapter, then telling the optimistic tale of America’s leading architects joining forces to create Chicago’s grand exhibition in the next. At the time, Chicago still reeled from the devastating 1871 fire that destroyed much of the city, and left 90,000 people homeless. The city was known more for its slaughterhouses than its cultural amenities. Chicago was decidedly a second class city according to elite New York opinion makers, and their opinions increasingly mattered in Washington D.C., where money and power come together to set the course of the nation. Chicago’s status as an underdog perhaps inspired Daniel Burnham and his partner John Root to try to build a model city for the world’s fair, an architectural marvel unequaled in the Western hemisphere on the shores of Lake Michigan, a temporary vision of what America could become. The White City was really a façade, a bit of expensive fakery built on a foundation pride and patriotism. From behind the façade, the architectural wizards tried to fool the world, convincing them that America was more than a backward state of castoffs from Europe. High in Burnham’s mind was the goal of surpassing the Exposition Universelle of 1889 in Paris, where Gustave Eiffel’s tower symbolized France’s industrial might. 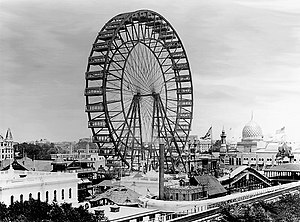 Burnham finally got his wish when George Washington Ferris built a faint-inducing thrill ride, an slow-moving, iron observation wheel, immortalized as the first Ferris Wheel. As these architectural wizards and power brokers created an idealized version of America, H. H. Holmes built a chamber of horrors on their doorstep. H. H. Holmes was frighteningly modern criminal, taking advantage of the anonymity found in an industrial age metropolis. As rail travel became more common, people’s lives became more transient; it was quite easy for a person to reinvent themselves, for better or worse, in a new town. For a con artist of Holmes caliber, a wink and a firm handshake in a new town was a ticket to money, romance, or murder, whatever suited his fancy. Holmes created a web of legal fictions to hide his schemes, sending creditors to visit fabricated owners to collect debts he owed. As young women came to Chicago, attracted by the prospects of jobs and excitement with the Columbian exposition, Holmes’ hotel and pharmacy served as convenient props to lure women into his murderous hands. Once disposed of, his victims families would ask in vain to Holmes’, who was always ready with a convincing lie to explain a beloved daughter’s sudden disappearance. What really adds a spine-tingling chill to this book is the contrast between our world, and the world of the late Victorian era. Today, murders are perhaps not more common, but 24/7 news coverage makes them seem more common. And certainly in my lifetime there have been many serial killers filling the daily headlines. Today, the media brings criminal activity in all its lurid details into our living rooms, giving rise to complaints from social critics that we’ve become inured to the horrors of crime. Larsen’s narrative immerses readers into the world of late 19th century Chicago, and really gives a sense of how innocent citizens were, with police officers being conned as easily as Holmes victims. Holmes blood-lust continued for years in Chicago, claiming somewhere between 20 and 100 victims, although some accounts claim as high as 200 deaths attributable to Holmes. Larsen’s book was one of the most engaging books I have read in a long time. It should satisfy history buffs, but also mystery and crime fiction readers. Even though this is non-fiction, the book’s gripping narrative style draws one in just as a good mystery does. Highly recommended! This entry was posted in Books & Reading and tagged book reviews, books. Bookmark the permalink.